Easy to make - yummy to eat! Many people ask me about Jams and Jellies for raspberries that aren’t all laden with sugar as the commercial pectin ones. I have been making raspberry jams for years without the use of these. I make my own pectin with green apples. This time of year someone will have an apple tree that is losing some of its growing apples. The ones I used yesterday are about the size of quarters. If you don’t have access to any of these, a Granny Smith apple will do. I use about one cup of immature apples cut in half. I put them in a heavy pot with about 1/2 inch of water. Cook about 20 – 25 minutes. The immature apples will not get soft like the full grown ones. Stir frequently, making sure that the pot doesn’t go dry. Drain the liquid from the pot into another container – put apple pieces in the compost or feed to chickens. In the heavy pot put 4 cups of washed raspberries and begin to heat using medium setting on stovetop. When they begin to fall apart and become juicy, add 4 cups of sugar and pectin juice you made earlier. At this point you need to be committed to standing there and stirring the pot. This will take about 20 or so minutes to complete now. The contents should begin to bubble and boil. After a couple minutes you can begin to watch for thickening. This is done by taking the stirring spoon and holding it sideways to watch the drops. When there are two drops coming down separately, it is not done. When the two drops start to merge into one – it is done. As I say, it usually is about 20 minutes. But it is important that you don’t overcook jam or it will cool to a sticky texture. If you don’t cook it long enough it will be runny. If you plan to can the raspberries for future use, pour into clean, sterile jars and cover with new lids that have been put in boiling water for a few minutes. Place all the jars in a hot boiling water bath in canner for 10 minutes for 1/2 pints or longer for bigger jars (see current suggestions from Extension Service) making sure water covers jars at least by an inch. Remove from water and cool on towel in a draft free place. Check lids for indentation. The above recipe can be done using a Granny Smith apple cut in quarters, cooked and drained. Jelly can also be made using cup of sugar to cup of raspberry juice and then add the pectin like for jam. Then watching for drips. For people who aren’t sure they want to tackle the old way for making jams and jellies but don’t want to use the Certos or other brands that use a lot of sugar OR don’t want to use sugar substitute can use a brand that I found at the Lakewinds Natural Foods in Chanhassen. It is called “Pomona’s’Universal Pectin”. Jams and Jellies can be make with ANY amount of sweetner. You can even use Honey if you wish. Now I can’t say that I have used it with honey but if you do and like it, let me know. Mix berries with sugar and tapioca in a bowl. Let sit 15 minutes then fill your pie shell. Top with butter and put top crust on and bake for about 45 minutes at 350 degrees. Cool to let berries set before serving. This is an easy to make salad that embraces the goodness of summer. If you have the spinach from your own garden it is even better! Off season, I use the pre-washed spinach in the bag. I usually use the 9 oz. bag and empty the contents in a large bowl. To this add a pint of either sliced strawberries or a half pint of fresh raspberries. Now you have a few options for nuts. I like to use the toasted almonds or pecans finely chopped with my salads. Many prefer to use finely cut walnuts. I use about a half cup of these. Another option I have seen and used a couple times is to cut up one green onion into small sliced disks. I have two recipes for dressings. 1/4 cup of red vinegar, 1/4 cup of sugar mix in blender. Add about 1/4 tsp of salt then turn the blender on medium and open the cap on top and add vegetable oil in a slow stream – about 1/2 cup. Continue until well mixed. 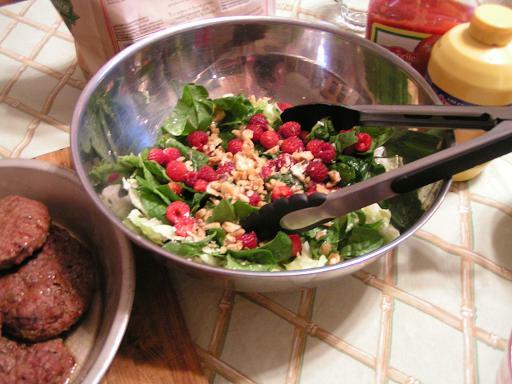 Add to salad – toss just before serving. 1/4 cup of vegetable oil, 2 Tbsp Raspberry vinegar, 2 Tbsp of raspberry preserves – mix in a small jar and refrigerate for 15 minutes before tossing it into salad. There is so much room for using your creative juices when using berries in salads! Any of you have a favorite? Yes, I did develop my site myself.